When Dhirubhai Ambani International School in Bandra, a western Mumbai suburb, held a sporting meet for the parents of students in February this year, it was no surprise to see actor Farhan Akhtar compete. Pushed by his daughters to have a go, the 39-year-old actor ran away (literally) with the trophies in all the races. Not only did Farhan make his daughters proud, his achievements were also a testimony to his fitness levels, which he had attained during the gruelling schedule for filming his forthcoming film Bhaag Milkha Bhaag. For over 18 months, Farhan ate, drank and breathed Milkha Singh, the legendary Indian athlete. Producer-director Rakeysh Om Prakash Mehra made sure the central character was played to a T and that included getting his lead actor to sprint like an Olympian. The two-man team that helped him 'become' Milkha Singh consisted of Melwyn Crasto, athletics coach for Central Railway, and Samir Jaura, fitness trainer. Read on to know how they pulled off the amazing feat. "Farhan has literally lived the character. He is psyched about work and I don't think any actor has this sort of dedication. Forget the training part, even the time factor...who will give a year and a half to a movie?" asks Samir. "Just watch the rushes, you see he has lived the part -- he hasn't shaved, he stuck to his diet, trained diligently. His biggest sacrifice is, he stayed away from family," adds Samir. While Melwyn taught Farhan the finer aspects of running, Samir took care of Farhan's gym sessions. "Rakeysh had given me the reference of Brad Pitt in Fight Club. He wanted Farhan's body to look like that. But I think Farhan's body looks far better than Pitt's," says Samir proudly. Melwyn says that for six months before shooting commenced, Farhan would train four hours a day. "He worked very hard. He was disciplined and punctual. When I gave him a time, he would be there 10 minutes prior. Sometimes he would reach the venue before me." For the first 20 days, training was held every alternate morning at 6.30 am to impart the basics of athletics -- how to run, how to lift your knee, co-ordinate your hands and body. "Then the focus shifted to a lot of speed workouts. He had to do a lot of endurance exercises to improve his speed," says Melwyn. Since he had to run like Milkha, speed was one area Melwyn says they really had to work on. "We had to test his endurance, flexibility, show him how to keep his arms, how to lift his legs while running. Once he perfected the technique, speed came automatically." Melwyn says Farhan was easy to work with. "I don't like nakhras (tantrums). When I first met him, he was very reserved. I was doubtful if he'd adapt to my style of training. "We'd have to work hard if we wanted results. But he was very cool. We discussed his weaknesses. He said he had never done athletics after school. He liked my style of training, respected my work and showed full faith in me. He did whatever I asked him to do. He never made excuses," says Melwyn. Farhan was also able to grasp things quickly. "Once I demonstrated a particular set of exercises, within three-four days he would be perfect. He is a quick learner. Within a month, he was doing the hurdle stretch, groin stretch, hamstring stretch, he was doing it all," says Melwyn. Farhan is always very professional and managed to maintain the required discipline throughout the demanding schedule. "It was training day in and day out for one-and-a-half years. We thrashed the guy's body. He did whatever was asked of him. At some locations, we had really substandard gyms and food, but he still trained. He never cribbed or complained," says Samir. Samir describes how Farhan's body undergoes a transformation in the film: "He has three 'looks' in the film. We shot backwards. The journey starts from childhood, where he looks like a school kid and then slowly grows in his 20s and 30s. Look 3 was shot first, that is where he was most beefed up. Then we brought his weight down." "It took us six months to get him into shape. Then we had three months where we had to change his look, cut his weight for Look 2. Both looks are drastically different. We are not talking of three or four kilos but a difference of 10 to 14 kilos," Samir says. Like the actor, the trainers also did their homework. "Before the film, I did a lot of homework on how national and international athletes look, what their body types are. Since he was playing the role of an athlete, we had to ensure symmetry of body. "I give him 10 on 10 for symmetry because very few people can boast of a proportionate physique. It's by far the best body I've seen in Bollywood," says Samir. Farhan also had to undergo high-altitude training, for which the trio stayed in Leh-Ladakh for 20 days before the shoot was to commence. "We would cycle 25 km and then go running uphill, downhill. We were staying near the Shanti Stupa which is on a hilltop. Every morning Farhan and Melwyn would reach the stupa by foot -- it was a 500 stairs climb -- and come down running. It was another training method for them," smiles Samir. To lend the movie more realism, director Rakeysh called for real athletes to play bit parts. "We hired national and international university and state level athletes to run in the competition scenes. So Farhan had to train to that level. It had to look natural. "During the shoot, while Farhan had to run his 100 per cent, these guys had to run 90 per cent. And he had tuned himself so well to running that these guys failed to believe that he was an actor!" says Samir. There was a carefully worked out diet plan as well. "His diet consisted of six to seven small meals a day -- white meat like chicken and turkey, fish, green veggies like brocolli and asparagus, and mushrooms. The food was grilled or steamed with very little salt. He was also given supplements for recovery, protein shakes and stuff like that," says Melwyn. Farhan was generally accommodating, but not when it came to food. "He once ordered a chicken dish from the Taj," Melwyn recollects, "but the production guys ordered from elsewhere. After just one bite, he realised that it wasn't from the Taj and the ADs received a firing!" 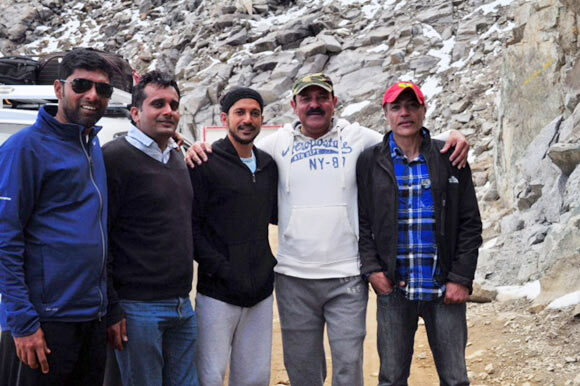 The trainers also had a good rapport with Punjabi actor Yograj Singh, the father of cricketer Yuvraj Singh. Yograj plays the role of Farhan's coach in the film. For three months, 40-year-old Melwyn also trained Hyderabadi actor Dev Gill, who is a Pakistani athlete in the film. The two trainers must also get their due, and it was fortunate they worked well together. "Sam and I didn't have any ego hassles. He understood my working methods and I understood his. He knows Farhan so he sort of helped me understand Farhan -- his weaknesses, his strengths in the gym and at training," said Melwyn about his partnership with Samir. Samir describes his working relationship with Melwyn as being based on trust. "The best part of training with Melwyn was that we worked for each other. We constantly kept each other in the loop on what our training of the day would be. On location, we would hang out together and being roommates helped us understand each other better." So, will all the sweat, toil and camaraderie bring success to this tough band of boys? We'll know only after July 12, when Bhaag Milkha Bhaag opens in theatres. Can you RECOGNISE these 'women'? The WORST South Indian accents in Hindi films? VOTE!